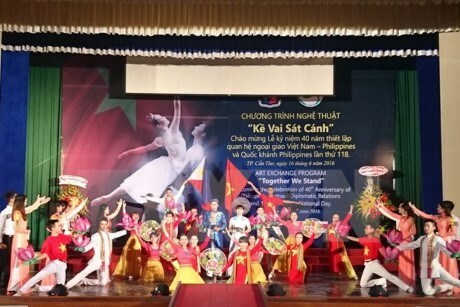 HCM City (VNA) – A cultural exchange, themed ASEAN friendship: Vietnam - Philippines, took place in Ho Chi Minh City on October 26. Speaking at the event, Phan Thi Hong Xuan, Chairwoman of the Vietnam-Southeast Asia Association in Ho Chi Minh City , said Vietnam and the Philippines have been active members of ASEAN in recent years, praising their bilateral cooperation in culture-education, trade and defence. She said Ho Chi Minh City has received a number of delegations of Philippine leaders and held activities with the Philippines in human resources training, art and cuisine. Philippine Honorary Consul General in HCM City Le Thi Phung said the 40-year friendship between the two countries has created solidarity between the two peoples. Highlights of their bilateral ties can be seen in politics, trade and education, she added, noting that joint education programmes have produced positive outcomes.